While most vintners search for unique characteristics to help define their terroir, Stan Simpson need only look out his window. 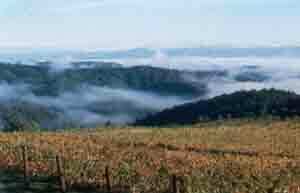 McCray Ridge itself is a jagged uplift, 1,700 feet above sea level on the southern edge of the Dry Creek Valley Appellation, a singular combination of topography, climate and sound farming. Two Moon Vineyard (named from the reflection of the full moon onto the vineyard pond) sprawls across the top of McCray Ridge and commands spectacular views — the Mayacamas Range, Healdsburg’s Fitch Mountain, the Santa Rosa plain. The vineyard’s terraces "twist and bend, much like an ‘E’ ticket ride," laughs Stan. "And farming it is no different." Situated above the fog line, Two Moon Vineyard begins each day in sunlight. The Pacific Ocean, 15 miles west, maintains a persistent airflow to cool the afternoons on the hottest of days. 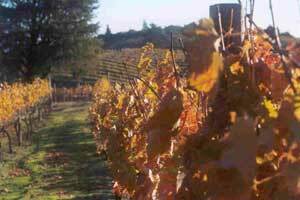 "The vineyard stays cooler than the inland valleys of Dry Creek or Alexander, but warmer than the Russian River Valley," says Stan. "Evening temperatures are typically cool while inversion layers counter frost on frigid spring mornings." 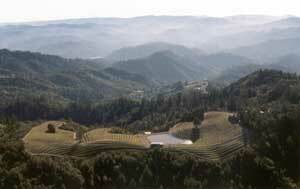 These climatic variations provide the mountain vineyard with a healthy growing season. Wanting to choose the grapes that would reflect the character of this mountain terroir, Stan first planted four acres of Merlot in 1987, contour-terracing the rows to take full advantage of soil and sun. And the vines have done well here – so well that in 1997 he enlarged the vineyard to include seven more acres of Cabernet Sauvignon. The secret to the success of Two Moon’s grapes seems to be in Stan’s “hands-off” farming style. He rarely interferes with a vine’s natural expression of what it is and where it’s grown. Farming practices are limited to what will best help vines maintain their balance of energy: to be stressed but not over dry; to have grape bunches exposed to sun but not burned; to be able to mature their grapes and still maintain energy to produce again next year.